Let’s start watching how the media covers the proposed expansion of a tar sands pipeline through northern Minnesota, a project that threatens our environment and provides no significant benefit to Minnesota. Today’s example is MPR’s story: Minn. oil pipeline fight stokes threats, fears of Standing Rock. Quick background: Enbridge Line 3 is a tar sands pipeline that runs from Alberta to Superior, Wisconsin, via northern Minnesota. Enbridge wants to abandon its old and deteriorating pipeline in the ground. It wants to install a new and larger pipeline, running 337 miles along a new route through northern Minnesota. It would cut through the Mississippi headwaters, threaten lakes and wild rice beds, and violate treaty rights. The MPR story is deeply flawed. Starting with the headline, the story raises “threats” and “fears” over the pipeline fight. So the first question to come to mind is: Who is doing the threatening and creating fear? Comment: In this frame, activists are “pressing” and even trying to “kill” the project. (“Kill” is a violent word.) State officials and company executives, on the other hand, are framed as peacemakers. They are “working” to head off a confrontation. They are doing “more than ever to listen” to concerns. As this frame goes,all that hard work and listening might not be enough to stop the confrontation, the threats, the fears. Those [DAPL] protests drew international attention. Thousands of tribal and environmental activists set up protest camps that were occupied for months. Dozens were injured in clashes with police. Comment: For starters, the phrase “dozens were injured in clashes with police” is poorly written and clouds what really happened. It should have been written in a way that makes it clear who did the injuring, such as: “Police injured dozens of unarmed protesters during clashes over the pipeline.” Why not say it clearly? Further, the MPR story fails to paint a complete picture about who created the “threats” and “fear” during the DAPL protests. 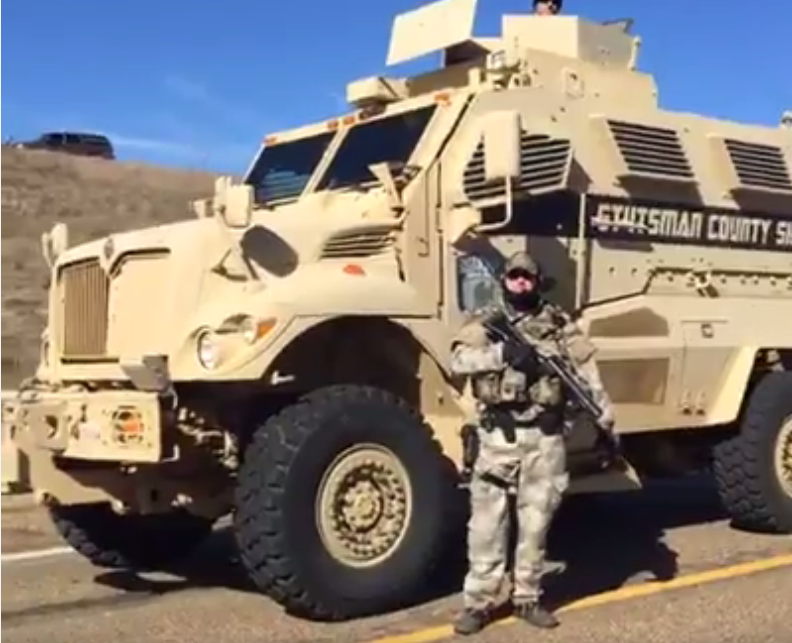 Screen capture of video showing the heavily militarized response to water protectors. Why highlight this one specific act of violence and ignore all the others? The shooter wasn’t caught. It is not clear what if any connection the shooter had with the Line 3 protest. This anecdote paints Line 3 opponents as violent. Comment: This fits into the story’s theme that an Enbridge Line 3 protest will “stoke fears, threats of Standing Rock.” Put mathematically, the story reads Standing Rock = Enbridge Line 3 = Violence. That’s bad math. 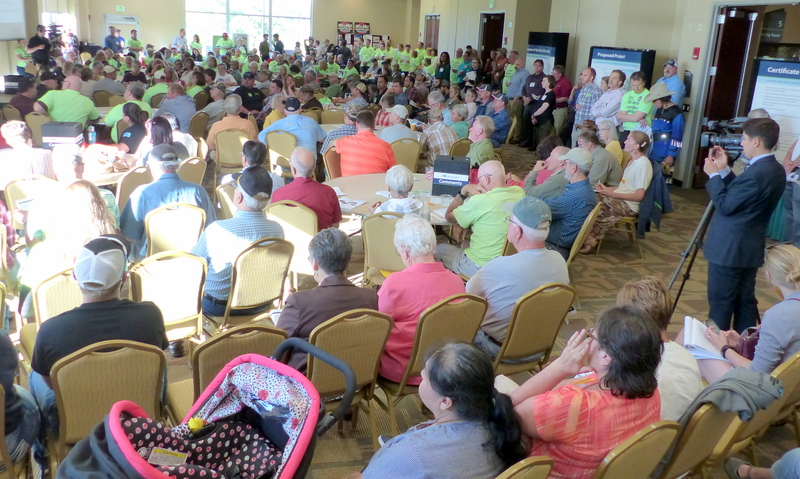 Hundreds of people already are showing up to public hearings, like this one in Bemidji, to state their opposition to Line 3. 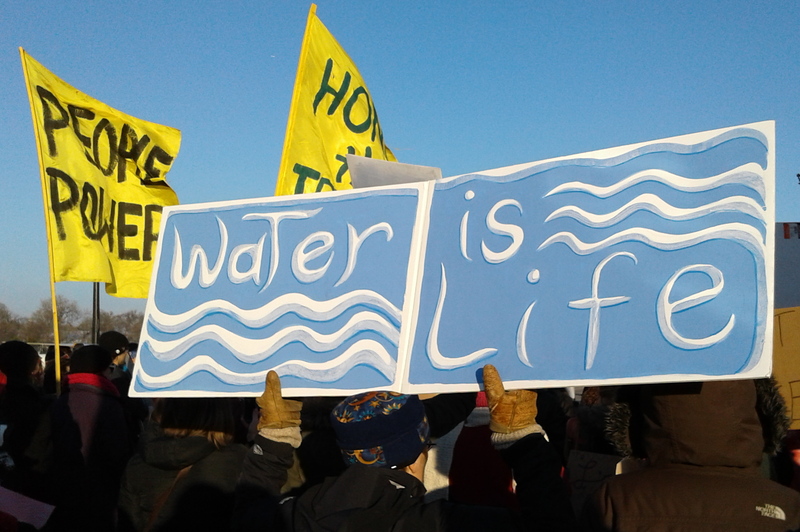 Those religious communities would not have not have taken such an action in support of this work if the anti-DAPL camps were a violent gathering. It is my hope that those same religious communities come out in support of prayerful, non-violent protests against Line 3. “I think what we’re doing now that’s different is just increasing the capacity in our organization to engage,” said Paul Eberth, who directs the company’s Line 3 replacement project. The company has added people to better reach out to tribes and others. One result of that outreach, he said, was a decision to reroute the pipeline around an important wild rice lake after the White Earth Nation voiced concerns. “We’re working hard to respect the sovereignty of the tribes and the rights that they have both on and off reservation, and make accommodations in our project to do that,” Eberth said. The question is, will those accommodations be enough to appease opponents who say the pipeline poses too big a pollution risk to the lakes and rivers of north central Minnesota, and would add worsen the effects of climate change? The decision to reroute the pipeline around one wild rice lake is a token accommodation at best. The line still runs by more than a dozen wild rice lakes. It runs through the Mississippi headwaters region. This does not solve the core issue in any significant way. The story asks the question: “Will those accommodations be enough to appease opponents?” implies this is a significant accommodation. It is not. And the answer is “no,” it will not appease opponents. Let’s make it personal. Say someone took $10 million from you and you wanted it back. How would it feel if that person said. “You’re right. I am listening and want to engage with you. I agree we need to come to an accommodation. Here’s $100. Let’s call it even.” Would that be good enough? Further, quoting Enbridge saying: “We’re working hard to respect the sovereignty of the tribes,” doesn’t make it true. Importantly, the MPR story let’s that statement pass as true instead of challenging it. The Anishinaabe have treaty rights to hunt, fish and gather along lands that will be affected by the pipeline. That’s the law of the land. If Enbridge truly respected tribal sovereignty, it would not have started the project until it had an agreement with the Anishinaabe. Why didn’t MPR push that question? Note: Enbridge already has started construction on Line 3 in Canada. It already is presuming it will get Minnesota approval. It has no apparent intention of making significant changes to its plans. ← Do American Indians Celebrate the 4th of July?